Many organisations send the message (overtly or covertly) that keeping our heads down with quiet submission is the safest way to hold on to our jobs and grow our careers. Research shows however that though silence is expected in organisations it can be extremely costly to both the organisation and the employee. Silence can increase politics, mistrust and stress. A cohesive team is able to speak openly and deal with issues as they arise, when they feel they cannot speak up resentment and misunderstandings are most often the cause. Silence can slow change and innovation. The people who deal with the product or customer each day often have insight they will not share unless they feel they will be heard, action will be taken (i.e. their opinions matter) and they will not punished for speaking up. We want to encourage employees to make innovative suggestions for change, or for modifications to standard procedures. 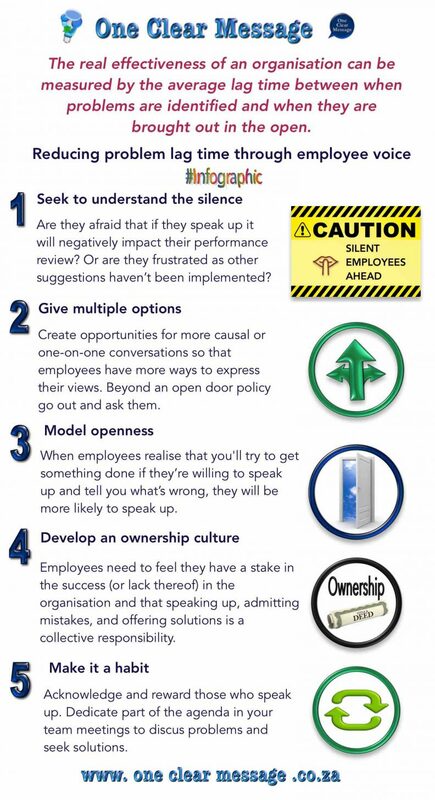 When it comes to building innovation and Employee Engagement silence is not a virtue. Consultants and business leaders often focus their attention on the leadership styles that will change the organisation. They look for ideas that will lead employees to change along with a renewed emphasis on mission, vision and values. With these as the primary focus employee voice is often overlooked. This limits the potential for generating engagement as research shows it is the employee’s experience of being able to voice opinions, concerns and ideas (and be listened to) which triggers the most engagement. A large part of what great engaging managers do is linked to employee’s having a voice through discussion and collaborative working: Employee collaboration and voice in action. 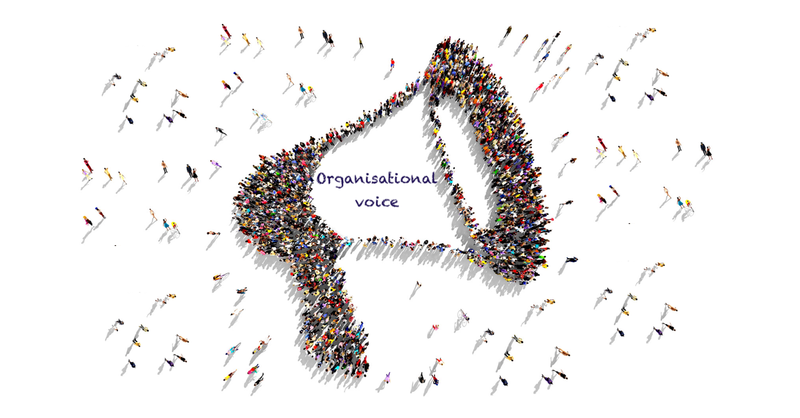 The key to employee voice lies in the employees’ ability to influence the outcome of organisational decisions through the opportunity to share their ideas and have them considered. Drop your ego. View contributions as a sincere attempt to improve the organisation. Employee voice often challenges the status quo so it can be easy to react defensively, which can quickly shut down contributions. Share the big picture and the value of employee’s individual contributions. When employees feel connected to the organisation they are more likely to speak up as they have a vested interested in its success. Make it safe. 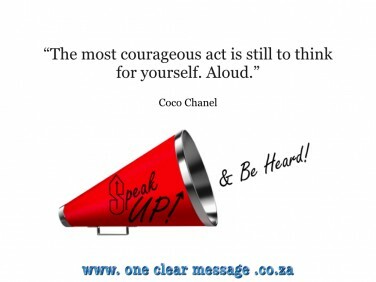 Acknowledge and reward those who speak up, those who show the courage to challenge standard procedures. Teach listening skills and how to give, receive and respond appropriately to constructive feedback. 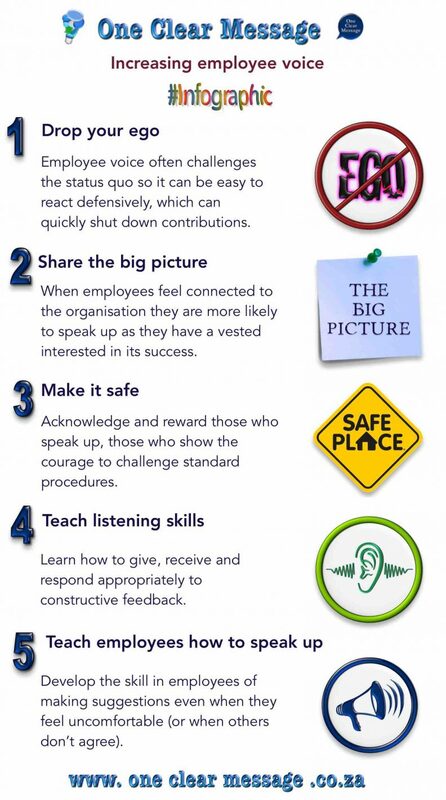 Teach employees how to speak up. Develop the skill in employees of making suggestions even when they feel uncomfortable (or when others don’t agree). Cultivating an open communication environment is tough because we are wired to be conservative,which is why the information we get from people at different levels of the organisation is likely to be filtered. Employees at lower levels in the organisation are often more in touch with customers and stakeholders than some of the senior decision makers, they understand many of the problems and possibilities intimately, and often know what works and what doesn’t better than management. Getting a handle on minor issues early, before they become bigger problems is the key. 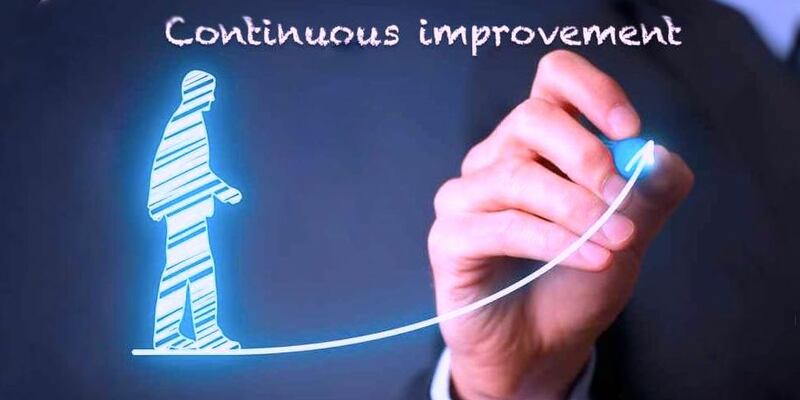 The real effectiveness of an organisation can be measured by the average lag time between when problems are identified and when they are brought out in the open. Seek to understand the silence. Silence often means people are holding back, whether in meetings or avoiding direct questions behind closed doors. As management it is up to us to understand why. Are they afraid that if they speak up it will negatively impact their performance review? Or are they frustrated as other suggestions haven’t been implemented? Give multiple options. Discussing issues publicly is uncomfortable for many people. Some might feel picked on, or worried they’ll say something unpopular. Create opportunities for more causal or one-on-one conversations so that employees have more ways to express their views. Beyond an open door policy go out and ask them. Model openness. Speaking up, or disagreeing with the boss often go against cultural norms and can be hard to change. We lose credibility with our team if we’re not taking risks with our boss, but are asking them to take risks why speaking up to us. Our willingness to raise issues up the ladder will make employees more apt to come to you. When employees realise that you’ll try to get something done if they’re willing to speak up and tell you what’s wrong, they will be more likely to speak up. Develop an ownership culture. Many employees think “Why bother? It’s not as though my opinion matters.” This type of thinking can be dangerous as it increases the problem lag time. 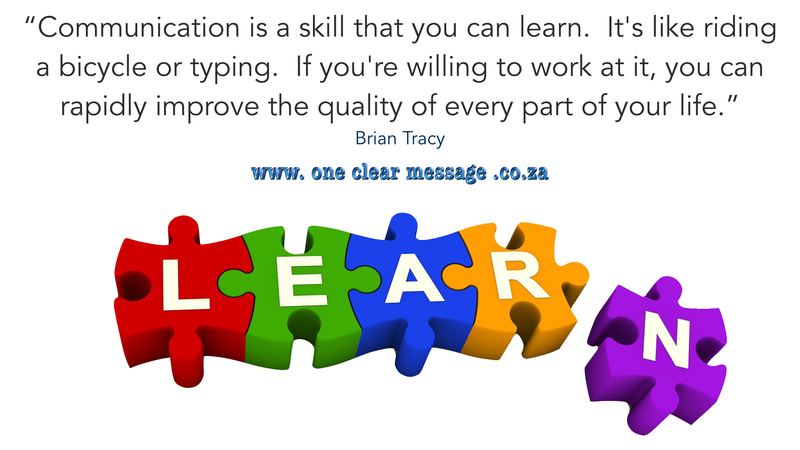 Employees need to feel they have a stake in the success (or lack thereof) in the organisation and that speaking up, admitting mistakes, and offering solutions is a collective responsibility. Make it a habit. To get people in the habit of speaking up in meetings set aside a few minutes at the end to ask if there are any issues you should be aware of. Acknowledge and reward those who speak up. Dedicate part of the agenda in your team meetings to discus problems and seek solutions. A good way to show that this process of putting things on the table is everybody’s job is to appoint a different person each meeting to bring up any issues and concerns. 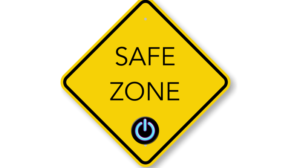 Create a safe zone. Build consensus around what the issues are then ask for solutions to deal with these challenges together. When Employee voice is encouraged in an organisation, when employees’ views matter and they feel they are listened to employees are more likely to speak out and challenge inappropriate behaviour and outdated processes when appropriate.